High-value, Compact Packaging. Will occupy 50% less wall space than typical aftermarket cables. Charge and sync your mobile device at high speed with the AZURA USB Sync & Charge Cable, a multi-purpose cable that can do your multitasking for you! 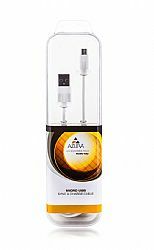 The AZURA Micro USB Cable is 6 ft in length (TWICE the length of standard OEM cables) and has two connectors, a Micro USB connector, and a standard USB 2.0 connector for simple syncing connectivity. Plug your device into any wall charger adapter or computer USB port for easy charging compatibility.